The Himalayan region is home to strong narrative traditions-evidence of which is found in a great number of Himalayan works of art. The exhibition, Once Upon Many Times, presents the variety of forms that tell stories of the Buddha, great teachers, legendary masters, spiritual quests, and adventures of heroes painted in thangkas, murals, and told in front of portable shrines. The contents of this Educator Resource are designed to be used by educators and students. Included are 3 key images from the exhibition and can be adapted to suit the needs of a wide range of classrooms and students. The guiding questions provided with each image are intended to draw attention to details in each painting and to the broad themes of the exhibition. It is always helpful to begin looking at each work of art with some basic open-ended questions that will elicit observations and questions. What’s going on in this painting/sculpture? What about this painting/sculpture made you say that? Where else have you seen something like this? Learn about the exhibit as you prepare to bring your students to the Rubin Museum. Introduce Himalayan art and the main theme of the exhibition to your students. Use the guiding questions as a starting point for students to conduct independent research. 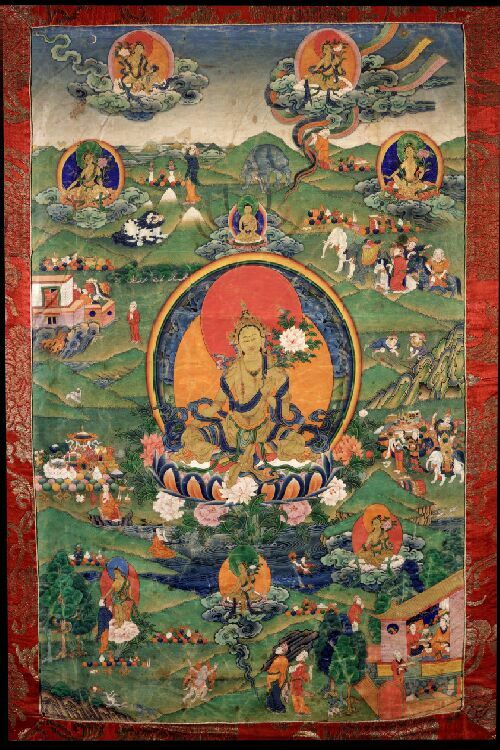 Explore the additional resources to learn more about Himalayan Art. This painting represents the most dramatic and central moment before the complete awakening of the Buddha. Legions of the army of Mara, who personifies all that prevents spiritual liberation, tried to thwart the Buddha’s awakening, but his resolve and meditation transformed the tips of their weapons into flowers. This popular episode has been rendered in ways that emphasize various aspects of the narrative. This example shows the Buddha with his hands folded in meditation rather than in the earth-touching gesture usually associated with this event. The bodhi tree, the tree of enlightenment, is portrayed as an evergreen, not the usual ficus religiosa (fig tree) of eastern India. 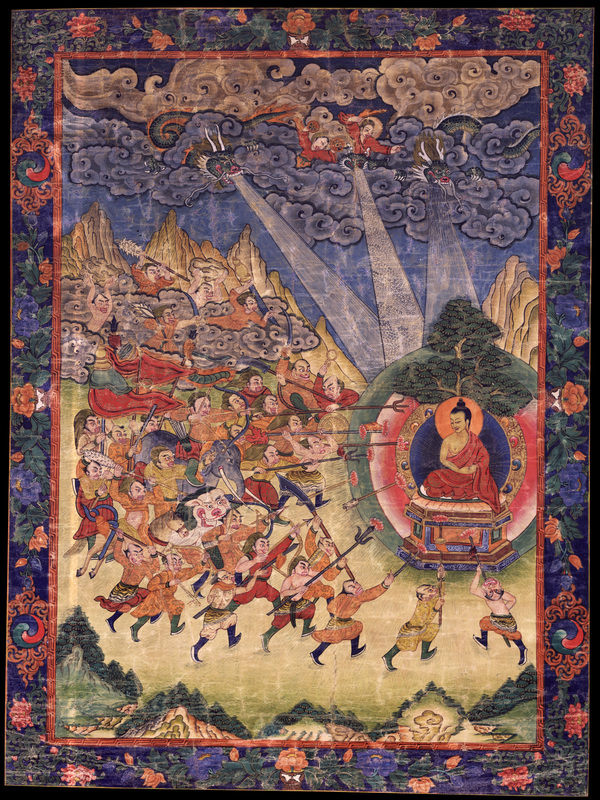 Mara’s army is represented in non-Indian conventions, including warriors in Central Asian garb (one riding an elephant), a Tibetan-style lion, and Chinese-style dragons sending down hail, all converging on the Buddha. Because this is a relatively recent painting, the artist had a variety of visual conventions at his disposal and has conveyed his own vision of the event. The story says that while the Buddha meditated throughout the night, he stoically battled various temptations of Mara who sent his army to attack the Buddha and disrupt the Buddha’s quest for enlightenment but all their weapons turned into flowers and their arrows rained down as a shower of flowers. This painting visually depicts this transformation through the power of the Buddha’s resolve in a rather inventive and literal sense. Who do you think the main character is in this painting? How can you tell? Choose one aspect of the landscape. What role does it play in the story? This represents a moment in a longer story. What do you think happens next? The Fifth Dalai Lama is one of the key figures in Tibetan history. He unified Tibet and established the rule of his government, which lasted for centuries. In addition to his activities of state, which included building Potala Palace in Lhasa, visiting the Chinese emperor’s court at Beijing, and continuing the complex master and patron relationship with the Mongol ruler, he was also renowned as a scholar, teacher, and practitioner who maintained close connections with masters of various Buddhist traditions. His life story encompasses the multifaceted realities of seventheenth-century Tibet. Buddhist masters (Atisha and Tsongkapa) and could manifest as a crow (depicted in the upper right corner of the painting). His death was kept a secret until the Potala palace was constructed and his reincarnation was chosen and the stability of the country was assured. 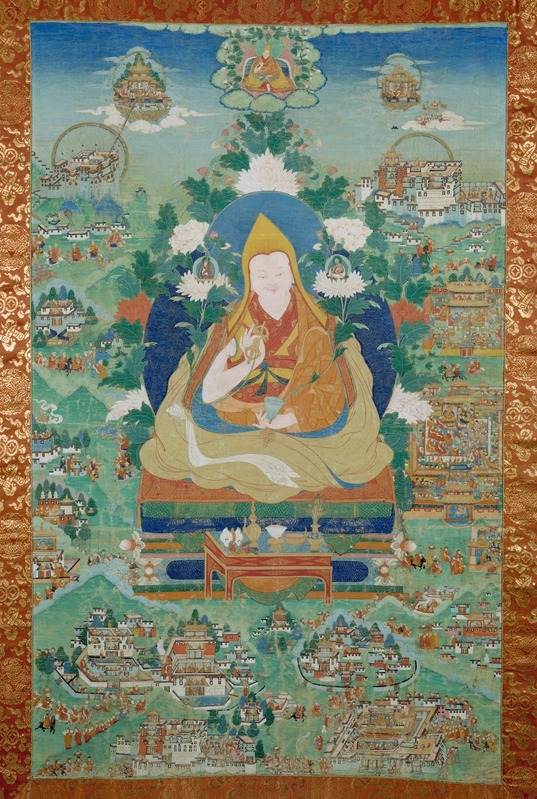 This painting presents episodes from his life in small narrative vignettes nestled within the landscape and placed around the large central figure of the Fifth Dalai Lama. The narrative moves counter-clockwise, beginning in the upper-left corner. The convention of showing the subject traveling between the scenes connects them visually, and they are identified by inscriptions. The site of Potala Palace is shown twice, as a setting for two different events – near the lower edge of the painting and in the upper right – implying the linear chronology of the narrative. What words would you use to describe the central figure in this painting? This painting depicts a series of events. How is each episode connected? How are they separated? This is an image of a powerful leader. Find an image of another important person. How do they compare? As one of the most well-known and popular deities in Tibetan culture, Tara is always called upon in times of need, and in the form depicted in this painting she is known as the savioress from eight kinds of dangers. The texts, written in the form of praises, generally identify these calamities as sickness, drowning, fire, imprisonment, bandits, wild elephants, snakes, and lions or tigers. There is also a more esoteric meaning ascribed to these dangers, which have associations with inner obstacles that prevent spiritual progress. This painting illustrates both the dangers and the means of escaping them. A large image of Tara is shown in the center so praises and requests can be directly addressed to her. She is also depicted in the surrounding scenes in which each danger is represented and contravened by Tara. These eight fears are meant to be literal, but also have a deeper significance. In Buddhism it is common to have different of meaning of interpretation, often seen in three stages: outer, inner, and secret. The outer meaning of the piece is the real fears in the physical material world experienced in ancient times. The inner meaning relates to the passions, ego and negative emotional characteristics that could be felt. The inner meaning relates to the mental world. The secret meaning has to do with tantric techniques and philosophies to transform these negative mental states into enlightened Buddhist states. The main character is represented eight times in this painting. Choose one scene and describe what you think is happening. How do the landscape elements relate to the stories in this painting? The main character in this painting is protecting people from dangers. What dangers would you ask to be protected from? Narrative – the representation of an event or sequence of events. Thangkas– Tibetan scroll paintings on cloth that often represent Buddhist deities or mandalas and can be rolled up and easily transported. Buddha– a title given to one who has attained spiritual awakening (enlightenment) in the Buddhist tradition. The term “the Buddha” often refers to Buddha Shakyamuni, Siddartha Gautana, who lived from approximately 563-483 BCE. Buddhism– a religion and a philosophy that is based on the teachings of the historical Buddha, Shakyamuni Buddha. The Buddhist tradition focuses on the attainment of the enlightenment and nirvana and release from an endless cycle of death and rebirth. Mara – an evil demon who attempted to prevent Siddharta Gautama from attaining enlightenment. Tara – a female deity and goddess for the benefit of all beings. Dalai Lama – Tibetan for “spiritual master.” The spiritual and political leader of Tibet since 1642 when the fifth Dalai Lama, Losang Gyatso, established secular and religious authority over Tibet. Enlightenment- A spiritual awakening. In the Buddhist tradition enlightenment is the moment when a complete understanding of the nature of reality and attainment of perfect wisdom and compassion is reached. Explore exhibition resources to further explain narrative paintings in Himalayan art. Interactive websites, and online catalogs are available for educational use.  Explore multimedia resources and videos. Find out about present and upcoming exhibition and programs at the Rubin Museum of Art. Browse and learn about the different programs the museum has to offer for students K-12. Search a virtual museum of documented Himalayan art that includes high-resolution images, essays, articles, thematic collections, bibliographies, and activities for children. Browse biographies and portraits of Tibetan Buddhist and Bon masters by religious tradition, geography, community, and historic period. Journey behind works of Himalayan art on this interactive site, revealing the stories, ideas and beliefs that inspired them. The site also lets visitors consider how peoples of other culture have expressed ideas on similar issues through their own artistic traditions.